WHO and health academics standing firm against the tobacco industry’s proposed new strategy during a press conference in Ankara, Turkey. In a public statement made at the Turkish Grand National Assembly Commission on Planning and Budget on 17 October 2017, Minister of Finance Naci Ağbal stated that plans to allow the importation and production of heat-not-burn tobacco products and electronic nicotine delivery systems (ENDS) in Turkey were withdrawn. He confirmed that these products would not be sold or produced in the country. The announcement followed a press conference and strong public reaction to the threats posed by the tobacco industry’s proposals to begin importing and producing heat-not-burn and ENDS products in the country. The press conference, held on 17 October in Ankara, Turkey, saw WHO and prominent academics and health specialists jointly voicing their condemnation of the tobacco industry’s proposed new strategy. The press conference was called as a reaction to an announcement made earlier by tobacco company Philip Morris International stating its intentions to support the establishment of a new entity, the Foundation for a Smoke-Free World. As part of this initiative, the tobacco industry planned to introduce a new range of harmful products. These heat-not-burn and ENDS products pose serious challenges to public health due to their high levels of nicotine. Electronic cigarettes, one of the most popular of such products, are devices that do not burn or use tobacco leaves but instead vaporize a solution that users inhale. The consumption of these products in recent years has increased at an alarming rate among youth and young adults, raising the probabilities of higher numbers of cigarette smokers in the future. 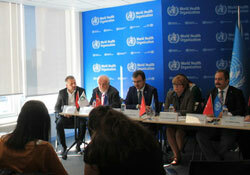 During the press conference, health specialists and academics joined WHO in its stand against the tobacco industry. Professor Mustafa Necmi İlhan, Dean of the Faculty of Health Sciences at Gazi University, stressed the importance of having all stakeholders play a part in a strong response against the tobacco industry: “To be able to struggle with these efforts, the Government should work hand-in-hand with academia and nongovernmental organizations while our national policies are formed and shaped,” he said. Professor Hilal Özcebe, Public Health Specialist and professor at Hacettepe University, remarked on the efforts of the tobacco industry to hide the real effects that these new products have on health: “The tobacco industry states that electronic products have fewer negative effects on public health but this is a totally false argument.” She explained that “electronic devices have the same level of nicotine as widely used products [such as cigarettes], causing similar vascular disorders and cardiovascular diseases”. Mr İdris Baykan, Head of the Ankara Branch of the Turkish Green Crescent Society, highlighted the remarkable efforts made by Turkey in the last decade to implement the WHO FCTC. He stressed that such progress was not achieved with the support of tobacco industry-funded foundations, but rather “by raising public awareness, with the support of the Turkish Government, civil society and organizations such as Green Crescent”. The tobacco epidemic is one of the largest public health threats the world has ever faced, killing more than 7 million people a year worldwide. More than 6 million of those deaths are the result of direct tobacco use while around 890 000 are the result of non-smokers being exposed to second-hand smoke. In order to fight this global epidemic, the WHO FCTC came into force in February 2005. In 2004, Turkey became one of the first countries in the world to ratify the WHO FCTC. Following this ratification, Turkey made great achievements in the implementation of the treaty by introducing smoke-free environments in restaurants, bars and cafes, gradually increasing taxes on tobacco products and including graphic health warnings on cigarette packages. This sustained political commitment to tobacco control has turned Turkey into a global leader in tobacco control and an important example of WHO FCTC implementation.